If all goes according to my calendar, our FET will take place four weeks from today! We are busy counting down the days. Even my hubby has gotten really excited, joining me in my countdown, whereas before he’s always acted a little guarded and nervous. He’s even been tolerating my nonstop pregnancy and FET chatter without annoyance–he’s a saint. Whenever the next step in this long journey is looming, all I start thinking about is babybabybabybabybabybaby. He’s been enduring it all as one of the most patient and understanding husbands alive. I took my seventh BCP this morning, so I have five more to go. Tomorrow I start Lupron. I’ll take my last BCP on Tuesday, and then the wait begins for AF. I’m not sure what kind of flow to expect. My reproductive system has been shut down by Depot Lupron since October 17th, and I’m only taking 12 BCPs, so will my body really have time to build up enough uterine lining to cause a full flow? I’m not sure if I should just expect spotting or a real AF. As long as something happens by Christmas Eve, I’m scheduled to start sticking on the Vivelle patches the day after Christmas. And then we go from there, with hopefully ZERO delays! I feel like my heart wouldn’t be able to take another postponement, but I know I would just have to deal and adjust. I am stronger than I give myself credit for. Nothing has knocked me down yet. Another weekend is approaching, full of baby shower stuff. My non-pregnant SIL is coming to my house, and we have to buy materials and then build a diaper cake to display on a main table at the shower. I am not looking forward to this project for obvious reasons, but I’m just going to take a deep breath and go along with it. It’s weird to me that I have good days and bad days regarding SIL’s pregnancy. Earlier this week, my eyes filled with tears when my non-pregnant SIL sent me a word scramble she had created as a game for the shower, and I ended up feeling sad and bitter all day. But then yesterday, I was excited to mail the invitations and start planning out some of the food that guests will eat. I know that the only reason I’m even halfway okay with everything is because I believe that our turn could be just around the corner. Think of me as a bad person if you wish, but it’s the truth. If our FET fails, it will be devastating for me to meet that baby at the end of February. Oh, please just let this work. All of my hopes, dreams, and happiness are riding on January 13th, 2011. * Hot flashes are miserable on airplanes. * Hot flashes are miserable on packed subway cars in NYC. * Hot flashes are miserable when you are trying to avoid being trampled at Macy’s on Black Friday. * Hot flashes are miserable when attempting to sleep without a fan blowing on me. I have a new side effect this week: slight cramping. This started on approximately Day 41 of this treatment. It almost feels like AF is on the way, but the cramps are not painful or intense. I emailed my nurse at CCRM to see if this is normal, since I certainly don’t want to have a non-medicated period. For one thing, the DL has helped suppress my endometriosis, so my reproductive parts are as clean as they are going to get right now. For another thing, my body seems to enjoy raining on my parade with cysts. So even though I’ll have a mild period after finishing BCPs, I shouldn’t ovulate (hence no cysts) or bleed heavily (hence minimum endo damage). In my e-mail, I asked if I should start BCPs a few days early to make sure AF will stay far away. The verdict was that most patients do not have AF on this treatment and that there’s no need to worry. I’m not sure if the cramping is random or if my ovaries/uterus are beginning to wake up from their imposed hibernation. Hot flashes are becoming fewer and farther between, thank goodness! I still feel them, but my days are no longer consumed by running cold water on my wrists every 30 minutes to cool off or blasting our fan on my face in the mornings. Good riddance! I was amazed that my emotions stayed very even and happy while in NYC. It can be a stressful place for a tourist, and I was guessing that I might turn into a two-headed monster while there. But actually, I enjoyed myself and felt very even-keeled during our entire trip. I did tear up yesterday for absolutely no reason at all while listening to “White Christmas,” but overall the mood swings are lessening. Insomnia is still present. I wake up several times a night, feeling wide awake. Headaches are only present because I’ve been graced with a cold. Because of the insomnia, I feel fatigued during the day. This is my last DL update! Next Friday (on my 29th birthday! ), I start BCPs and officially begin the FET prep. I am happy that I went through this treatment, because it is just one more variable that we’ll be able to cross off if our FET fails. Time has also seemed to stand still as I counted down the days and endured the side effects, but regardless, I wouldn’t change my decision to add DL to my protocol. I hope these updates are beneficial to those of you who find my blog and are preparing for your own Depot Lupron treatment now or in the future. At least you will somewhat know what to expect, although your side effects could vary. To see all DL-related blog posts, click the Depot Lupron category in the right pane. If you have any questions, feel free to email me at ccrmjourney@hotmail.com (or comment below and I will answer!). Happy December! We are back from an awesome six-day vacation in New York. Originally I had planned to type my weekly Depot Lupron update on my iPod Touch, but my WordPress app was not cooperating. Our little getaway was the perfect distraction from our FET countdown. Speaking of that countdown, it is now in single digits!!! Time is starting to move quickly now. I start BCPs in only NINE days! As my body floods with estrogen once again, the hot flashes will dissipate… I can’t wait! Also, my first acupuncture consultation is six days away. I’ll probably pick up the medications this weekend. Eek, can’t believe it’s finally time!!! We’ve made a few big decisions recently, and I’ll be writing about them soon. I’m in catch up mode today, but stay tuned! I’m feeling hot-hot-hot this week. My hot flashes are at their worst at night and in the morning. Maybe I’m just preoccupied in the evenings and don’t notice them as much, or maybe they’re not occurring. I’m not sure. I felt a little off-my-rocker this week. A few days, I just felt on the verge of tears for no rational reason. I’ve felt off-and-on depressed and angry as well. I know (and my hubby knows) that it’s just the medication. Exercise seems to help control my emotions, but I’ve felt so tired this week, I haven’t really been very active. My newest side effect is insomnia, and I don’t think my lack of sleep is necessarily related to hot flashes because sometimes when I wake up, I feel nice and cool. I’ve been waking up 4-5 times a night and feel anxious until I calm myself down. Normally I’m a pretty heavy sleeper, so this is certainly not the norm for me. No headaches or breakthrough bleeding. I was worried that these side effects would return since this was Week 1 of the second injection, but I had no reason to be concerned. Nineteen days until this end of this treatment and the beginning of FET prep. It’s so nice to be in the ‘teens… the end is in sight! Thank you all so much for following along with me through all of these delays. I appreciate it greatly! 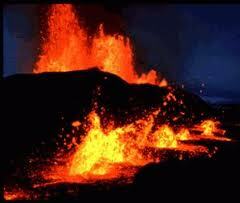 The hot flashes have majorly intensified over the past week. Yuck! Because the weather is cooling off here, I am wearing long-sleeved shirts or light jackets to stay warm. Quite suddenly, my face is set aflame, and an inferno invades my body. I break out into a cold sweat and have the urge to rip off everything I am wearing, and then just as suddenly, the volcano inside me goes dormant again. This is not. fun. at. all. My saving grace at night is the cold wall against which our bed is positioned. When I wake up sweating frequently throughout the night, I throw all blankets aside, scoot my dogs away from my legs, and press my hand/wrist/arm against the cold wall. This thankfully helps cool me off a bit. Just three more weeks of this, and then I get to start BCPs. I cannot wait! The first few days of this week, I felt like I was on fire. Then I felt less side effects the rest of the week, perhaps a sign that the Depot Lupron is losing effectiveness? But alas, with injection #2 administered yesterday, I’m sure it won’t be long before the hot flashes return with a vengeance. * Hot flashes-My advice is that when you sleep, place an ice pack or a Ziploc bag filled with ice and water on your nightstand. When the hot flashes bother you, press the ice pack against your cheek. This seems to really help me. * Mood swings-I felt better emotionally this week, for the most part. Still a few moments of extreme irritation (especially aimed at dumb drivers during my commute), but I saw an improvement over last week. I’ve been exercising every day to burn energy and earn endorphins, and I think it’s really helping! * Headaches and breakthrough bleeding–None at all this week. * Hunger, weight gain, energy-I swear I feel hungrier lately! Food is just not satisfying me like usual. I’m pretty sure I’ve gained a couple of pounds, so I’ve been briskly walking most days at lunch or hopping on our elliptical in the evening to stave off further weight gain. I do have less energy, but maybe that’s partially due to exercising and wearing myself out. This morning Depot Lupron injection #2 was jabbed into my hip. The month following injection #1 flew by, and I’m anticipating this month will pass even more quickly, since the holidays are looming. Our FET is now nine weeks and six days away, meaning we’re out of the double digits! Counting down the days in small increments seems to really help make the time pass more quickly. I’m lucky that this delay is occurring while we have so much fun stuff going on in our personal lives. Weekend trips to visit family, attending or watching our favorite college’s basketball games, and Thanksgiving in NY are all events filling our weekend calendar this month. Any other time of year, I’m sure the days would drag and the wait would seem endless. Tomorrow my second Depot Lupron injection should be delivered to our house. Only four more days until injection #2! The hot flashes were bad yesterday–I probably had 30+ throughout the day. I slept with an ice pack on my nightstand so that whenever I woke up with the sensation that my insides were hot lava, I could press the cold pack against my neck/face/arms and feel relief. In the middle of the night, my sweet hubby turned a fan on me to help me sleep. The problem with that is, I felt cold when the hot flashes weren’t occurring. So sleeping at night is a definite struggle right now. Oh well, the end is in sight–only 31 days until this treatment concludes and I start popping BCPs into my mouth. That doesn’t seem so bad. And hopefully, hopefully, hopefully–This will all be worth it!!! I hope I don’t scare anyone away from trying this treatment. The hot flashes are not extreme or painful in any way; they are just annoying. I’m trying to provide a first-person account of how this medication affected me, but I hope I’m not making it sound too terrible! The medicine was in full effect this past week. Hopefully this means my little beta-3 integrins are preparing themselves to welcome two little embryos in a couple of months! * Hot flashes-These started this week. I would guesstimate that I feel 10 of them per day currently, each lasting a couple of minutes. As I previously described, my cheeks feel flushed first, and then the warmth creeps down throughout my body. Each hot flash lasts a minute or two. I wake up hot all night and have to kick off my comforter until the coolness returns. It’s not unbearable by any means, but it’s a weird sensation. * Mood swings-I turned into a bit of a Dr. Jekyll/Mr. Hyde this week. My hubby told me he’s looking forward to me returning back to normal, LOL. My moods varied from weepy to angry to sad, with no rhyme or reason. * Headaches-No real headaches to speak of this week, thankfully. * Breakthrough bleeding-No bleeding at all this week, not even spotting. Depot lupron injection #2 is scheduled for next Saturday the 13th, six days from now. The medication will be delivered on Wednesday, and I’ll have a nurse at my local monitoring office administer the injection again to prevent any human error on our part. Our FET is 10 weeks and one day away! 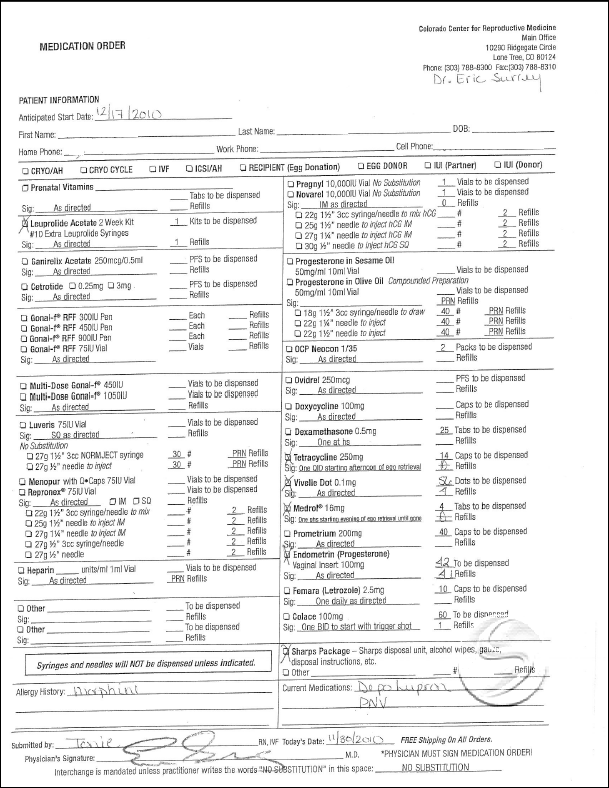 The second major side effect listed on the sheet that accompanied my first depot lupron injection is Mood Changes. (Hot flashes is the first side effect listed.) Starting this week, my mood has taken a huge nosedive. It’s like one of those little planes at air shows that hurtles toward the earth in a death-defying manner, only my plane is crashing instead of pulling up at the last minute. This feeling started around the same time as the hot flashes, so I’m positive it’s caused by the medicine and not anything in my environment. It’s nothing I can’t handle and the negative feelings aren’t constant, but they are present and as much as I would like to present these couple of months in a positive light, I’m acknowledging them on this blog for future DL patients. Just keeping it real, folks. I feel like I’m on the verge of tears, and I feel some symptoms of depression–fatigue, anxiety, lack of energy. I became angry and overreacted to the hubby the other night, and we very rarely argue. He may have his hands full for six more weeks, until I start BCPs to add estrogen. I am very lucky that he’s one of the most patient people I know. The hot flashes continue… they are not terrible, but I’m guessing they are here to stay for a while. I feel very hot at night. I’m trying to keep myself busy, exercise to earn endorphins, participate in activities that make me happy. College basketball has begun, so that is one huge plus. My sister and nieces are visiting this weekend. We leave for a Thanksgiving vacation in New York in about three weeks. And counting down the remaining days of depot lupron in small increments also helps–I’m in single digits now until the second DL injection. Nine days to go! Sixteen days after my first depot lupron injection, the hot flashes are starting. I am SO glad that fall is here and the temperature outside suddenly dropped. I work in an old, cold building, and at home we are still in that in-between stage of not wanting to turn on the heat, so right now the hot flashes don’t seem too bad! My first symptom seems to be that my cheeks start to feel flushed. Then I feel a clammy sensation throughout my body, almost like I might break out into a sweat. And after just a few minutes, I’m back to feeling cold. I’m always hot at night because both of our dogs sleep pressed against my legs, and you’d be amazed at how much body heat a 16-lb and 18-lb dog can generate! But the last few nights, my sleep has been interrupted by the feeling that it’s 80 degrees inside my house. I have to physically climb out of bed and soak up some cold air to cool off. The hubby left the space heater on in our room the other night, and he felt my wrath when I woke up sweating. : ) His teeth are going to be chattering soon, I think. Eleven days until depot lupron injection #2. I actually feel lucky that the hot flashes are just now starting, and that (so far at least) the hot flashes are pretty mild. To the women out there who have had to bear the brunt of these side effects, I salute you! 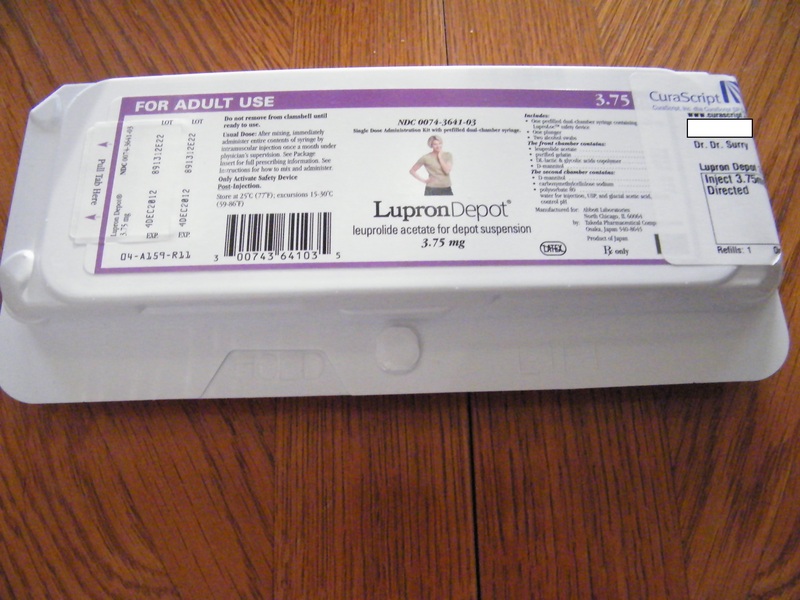 This week, my Depot Lupron side effects seemed milder. Perhaps last week, my body was adjusting to the medication, resulting in some more severe side effects. * Headaches–Ibuprofen + caffeine has been really effective for the headaches I have experienced this week, but overall they seemed to be much fewer and farther between. Thank goodness!!! * Breakthrough bleeding–I had some light spotting on Tuesday evening, but that was it. Hopefully last week was just my body getting rid of the last part of my lining, and I’ll see no more spotting/bleeding until after this treatment. * Hot flashes, Mood, Energy, and Libido–I honestly haven’t noticed anything different yet in any of these categories. It’s still pretty early to be feeling the full effects of the medications, so we’ll see how the next week goes. Thirteen days stand between me and Depot Lupron injection #2. I already called in the refill, and it will be delivered on 11/10, three days before my second injection on 11/13. So far, so good! Today is Day 7 of Depot Lupron (or Lupron Depot, seems to be interchangeable). Every week, I will post about the symptoms I’m feeling in hopes that it will help future DL patients know what to expect (although their side effects may vary). * Breakthrough bleeding–This started four days after the injection and was heavier than spotting but lighter than a full-blown AF. It lasted one full day and then very briefly the next day. It was accompanied by feelings of crampiness, but nowhere nearly as painful as when AF is really here. * On-and-off pounding headaches–This has been my worst symptom so far. The headache comes and goes, but it almost always makes my head pound. On Thursday night, I was awake half the night because the pounding behind my right eye prevented me from sleeping. I took extra-strength Tylenol and finally felt some relief. My nurse suggested taking four 200mg Ibuprofen with a little caffeine, and I’m free to treat the headaches with this combo until I start BCPs. Alcohol (like a glass of wine) seems to exacerbate the headaches, so I have totally cut myself off from even one drink. Hopefully the next time I enjoy an alcoholic beverage, we’ll be a family of three or four! Only 20 days until my second Depot Lupron injection! Today it’s been four days since my first Depot Lupron injection, and I am bleeding. I intend to provide weekly updates on the side effects I’m feeling, and this breakthrough bleeding is the first. It’s not as light as spotting, but not super-heavy, and it started around noon while I was out walking in a park. I have felt a little crampy today, but I was surprised to see more than spotting. And those of you out there who have been through the DL treatment: did you experience breakthrough bleeding? This morning I went to my local RE’s office for my first of two Depot Lupron injections. Everything went smoothly, except that I waited in a tiny room for 30 minutes before they gave me the shot (they treat me like a second-class patient, presumably because I’m not cycling there). This injection can be given anytime between Cycle Days 1-7, but administering the injection between CD 1-3 helps reduce the chances of breakthrough bleeding. Today is CD 3 for me, so hopefully I won’t have to deal with any unwanted spotting. I’ll have enough to deal with considering this medication causes menopausal symptoms like hot flashes, headaches, mood swings, achy muscles, and fatigue. It also repairs beta 3 integrins in the uterine lining (the proteins that create the “sticky stuff” needed for implantation), so hopefully all the yucky side effects will be worth it. Thirty days from now, I’ll have the second injection administered, and then I can start prepping for the embryo transfer 30 days later. I figure I’ll post weekly about how the Depot Lupron is making me feel. From what I’ve read of others’ accounts, it’ll be at least a couple of weeks before I feel anything. Tomorrow is our second wedding anniversary, and we feel like we have plenty to celebrate this year. We still have a few months to go before this process is over, but we finally feel like we’re over the hump. Thanks to CCRM’s amazing lab, we have five CCS normal embryos frozen in a lab in Colorado, and hopefully one or two of them will become our first child(ren) in 2011!